(VEN) - Labor safety issues in the construction sector have been discussed at a seminar recently held by the Vietnam Government Portal. Who is responsible for labor safety? According to the Ministry of Labor, Invalids and Social Affairs (MOLISA), last year saw more than 6,700 labor accidents, causing nearly 7,000 injuries and 630 deaths, with the most serious cases including scaffolding collapses at the Hung Nghiep Formosa Ha Tinh Steel Company’s construction site and at a 17-storey building in Ho Chi Minh City, and a crane collapse at the Cat Linh - Ha Dong metro construction site. Employers or contractors should take responsibility for occupational accidents. Inspections discovered that incompetent contractors had hired subcontractors at lower rates who later displayed weak capacity, for example, employing seasonal workers and lacking labor safety supervisors, said Director of MOLISA’s Department of Work Safety Ha Tat Thang. 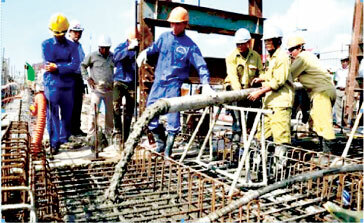 However, MOLISA recently sent construction inspection teams to Ha Tinh and Ho Chi Minh City, which have found that 23 out of 49 construction companies had not organized any occupational health and safety (OHS) training courses for their employees, 2,500 untrained workers and 150 pieces of equipment that had not been quality-tested. Thanh Binh JSC Managing Director Nguyen Chi Thanh insisted that every worker should be well aware of OHS risks when engaging in any job. For hazardous tasks, employees may request their employers to provide necessary personal protective equipment or deny these tasks. However, accidents may still occur to careless employees with personal protective equipment. One of the reasons for continual labor accidents is that the construction inspection force has failed to be reinforced. And as a result, only 0.22 percent of construction companies had been inspected. According to Deputy Director of the Ministry of Construction’s Department of State Assessment of Construction Work Quality Le Quang, although OHS regulations have fully defined the roles of investors, contractors and supervision consultants, the related sanctions seems not strict enough. Those attending the seminar agreed on resolutely handling OHS violators. To curb OHS violations in the future, it is necessary to improve construction inspections to make investors and workers more aware of OHS risks. The Ministry of Construction is expected to publicize a list of incompetent construction investors via the media while rapidly finalizing detailed construction safety regulations, Le Quang said. Employers will be fined VND30 million if failing to offer their employees OHS training courses, and VND5-7 million per untested piece of equipment and could be prosecuted. Investors in constructions with more than one OHS violation should have their investment licenses revoked or should be forced to stop construction, Ha Tat Thang added.